Well done to all athletes who competed in today’s Heart of England. WE WON THE MATCH! This put us third in the league so we just missed out on promotion but an excellent win today nonetheless. There were too many successes to mention everyone by name so I just want to say a big well done to everyone. 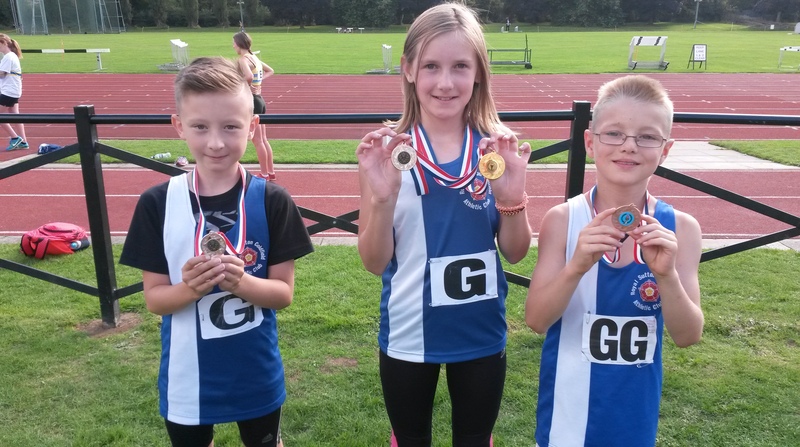 A special mention to our under eleven medalists (pictured here)….Evan Pritchard (75m silver, 11.2s ), Freya Liddington (75m silver, 11.6s and howler gold 30.04m) & Joe Creed (75m bronze, 11.5s). Elsa Buchanan also claimed two medals but was unable to come today. Gold in the long jump, 3.94m & bronze in 600m, 2.04.3).